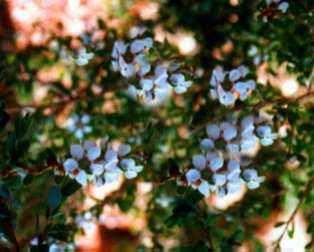 Medium shrub or small tree 10-20' with grey-green foliage and white flowers in winter/spring/summer. Hardy to most soils and situations. Excellent small tree for small gardens, with knarled trunks developing with age. Tolerant of moderate frosts and extended dry periods. Tolerant of salt-laden winds and makes an excellent windbreak on exposed coastal sites.